Lawsons Showground, Herons Reach, East Park Drive, Blackpool FY3 8LL. From the M55 motorway, head towards Blackpool from junction 4, following the signs to Blackpool Zoo. The showground is located on the right, 500m before the entrance to the zoo. Event HQ will open at 5.30pm. The event itself will start at 7.30pm. We recommend arriving early to collect your event shoe-tag and to get yourself ready before the firing of the gun. When you arrive on event night, you will be given your pre-booked event bib number which you need to wear on your front during the event. At the finish line, after you have completed your 5k circuit, this will be given your spookily amazing blingtastic medal only if you have your bib number on. It is compulsory that you wear a head torch or similar device to light your way. You don't need anything fancy, even the cheapest will do for the night. The event is open for everyone to get involved as long as you are aged over 11 on the night. Runners and walkers are welcome, including the use of running buggies, and nordic sticks. Parking is available at De Vere Herons Reach Resort and also on-street parking on the perimeter of Stanley Park across the road. At the Event HQ you will find the race pack collection desks, enquiry point, toilets and small item baggage drop area. You may even spot the odd pumpkin or two! An entry into the event has to be pre-booked and paid for online in advance of the night. There may be an opportunity to enter on the night but we cannot guarantee there will be spaces available. Please click the button below complete the entry form to secure your place. All major debit and credit cards are accepted. A confirmation email will be sent when your entry has been processed. Standard Entry Terms & Conditions apply. Entry on the day MAY be available and will incur a £5 extra charge. 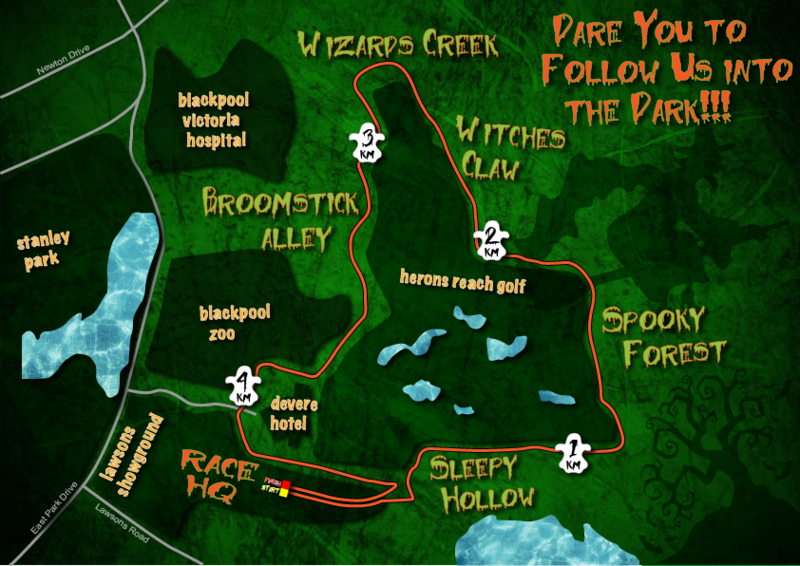 All competitors will receive an extra special spookily blingtastic medal at the finish of the 5k circuit. When you arrive at Lawson's Showground, make your way to the registration marquee to check-in. This is where you will be issued with your event pack which contains a bib number with pre-attached chip timing tags. Check-in opens at 5.30pm. At the check-in area, you will find toilets, an information kiosk if you have any questions, and a baggage storage area. There is also a key safe to leave your car keys if you wish. When you arrive you will be issued with a bib number and an electronic shoe-tag. This needs to be attached to your shoe, around your lace. The number number needs to be pinned to the front of your running top. The will record your time on the course. This will be removed at the end of the event and exchanged for your finishers medal. The course is marked out with glow-in-the-dark arrows throughout. It will be dark, so we recommend wearing a head torch. There will be marshals on the course to assist you around the course. BE WARNED! Not all the marshals are there to assist you. Some of them have other intentions! Keep your eyes peeled and your wits about you. If you manage to make it around the course, evading the scary marshals, you will be greeted at the finish line by the event team with your finishers medal. There will be bottles of water, soft drinks, chocolate and sweet bags for the kids (and big kids). • If you need assistance - Ask!